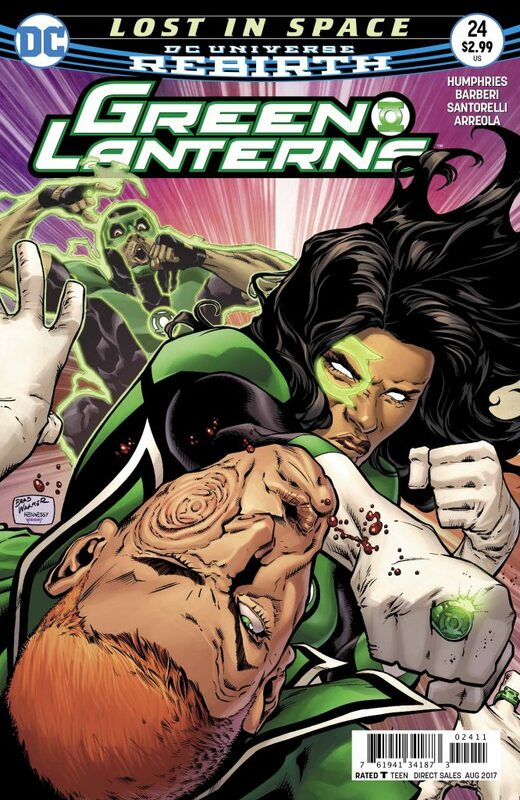 Green Lanterns #24 Review – AiPT! The world of Simon Baz and Jessica Cruz has opened up quite a bit recently as they’ve been pulled in with the Green Lantern Corps and given a proper look over. So far they’ve been on their own, but can they survive the trials and tests of Kyler Rayner and Guy Gardner? “LOST IN SPACE’ part three! As their training on Mogo comes to an end, Jessica and Simon prepare to reunite and head back to sector 2814 and Earth, but the new partnership between the Green Lantern and Sinestro Corps may mean reassignment and new partners. Sam Humphries continues to write incredibly strong characters with strong use of captions to put you right inside their heads. The series has done well to capture a buddy cop feel, which is a nice way to differentiate Green Lantern characters as they’re either loners or part of a bigger corps. The art is quite good in this issue. If you like constructs you will love what Carlo Barberi does with this issue. Simon and Kyle basically have an all out fight and there’s a lot of fun and surprising choices they conjure with their rings. The colors by Ulises Arreola capture the lime green sheen that helps make the constructs magical too. If you ever wanted to see a bit of strategy as constructs go against constructs there are quite a few clever examples here. The pencils are also very sharp with a bit of a manga feel (especially in Jessica’s face) that gives the book a modern look and feel. The way muscles and bodies are drawn you might just get a Humberto Ramos feel from the art. People will love the scenes between Jessica and Guy, Kyle and Simon, but they’ll be talking about a flashback sequence that builds on the original ring wearers. To say Humphries does the ultimate flashback turn is an understatement, as he goes back 10 billion years to Mars. These scenes have a western feel that’s quite cool and helps flesh out the lawlessness of the universe before Green Lanterns existed. Volthoom’s story is developed well on top of this flashback and it’ll be interesting to see how these scenes connect. Much of the issue is just downright fun. Jessica has a few doubts, but with some tough love from Guy, Humphries shows these characters are always growing. It’s also nice to see Jessica and Simon be tested on their own. So far they’ve been stronger together, but Humphries makes the case that some day they may be out on their own. It’s safe to say this series has fleshed these characters out well and I wouldn’t be surprised to see them for years to come as major Green Lantern characters. It’s worth noting much of Simon and Kyle’s fighting is for fun only. There’s no character work, no real story development, just two guys having a bit of fun and having a laugh doing it. The scenes are enjoyable, but don’t progress anything. Who said comics can’t be fun!? Sharp art highlights an issue that delves deep into Green Lantern history, progresses the villain’s plot, and is a construct fan’s dream come true. Green Lanterns may be the best at character work, but it can sure as hell be fun too. Does a lot well including bring the fun with Green Lantern constructs. The villain's scheme is hatched!